Whip up a batch of Christmas scented cloud dough for fabulous sensory play this holiday. This cloud dough is easy to make and lots of fun for the kids. 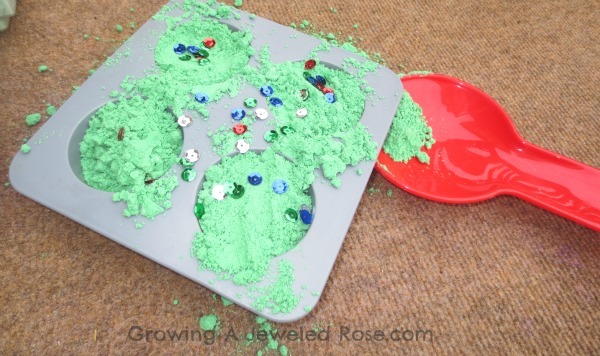 Follow Growing a Jeweled Rose on Pinterest and Facebook for tons more kids activities. 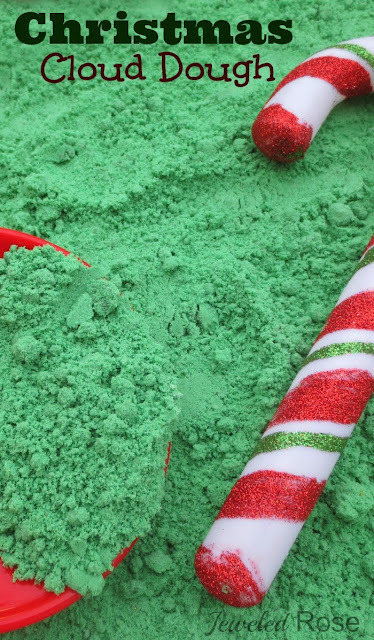 Combine the powdered tempera paint and flour. Add a few drops of peppermint extract. Pour in the oil and mix well. Mixing will take a few minutes. When done you will have an amazing substance known as cloud dough! Cloud dough feels just like silky clouds in your hands, but it is mold-able. 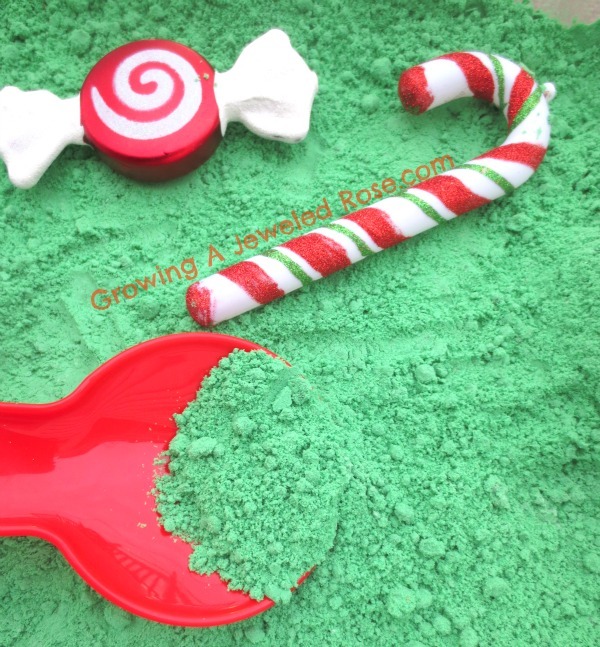 It is gloriously fun and one of my girls favorite sensory materials. 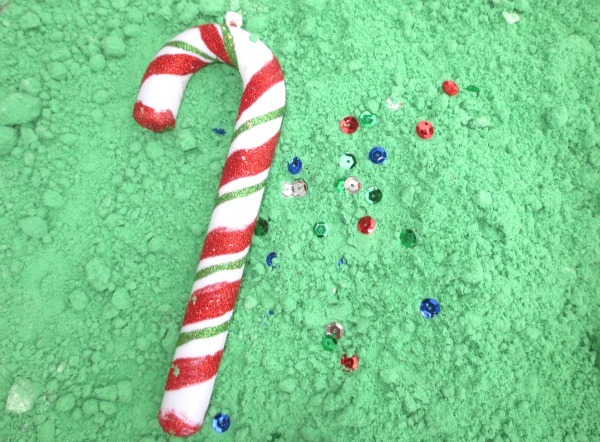 We used green powdered paint, but you could also use red to get a peppermint color. If you do not have powdered paint on hand you could also use crushed up sidewalk chalk to color the cloud dough or skip this part altogether. The natural white color of cloud dough is very fitting for peppermint. 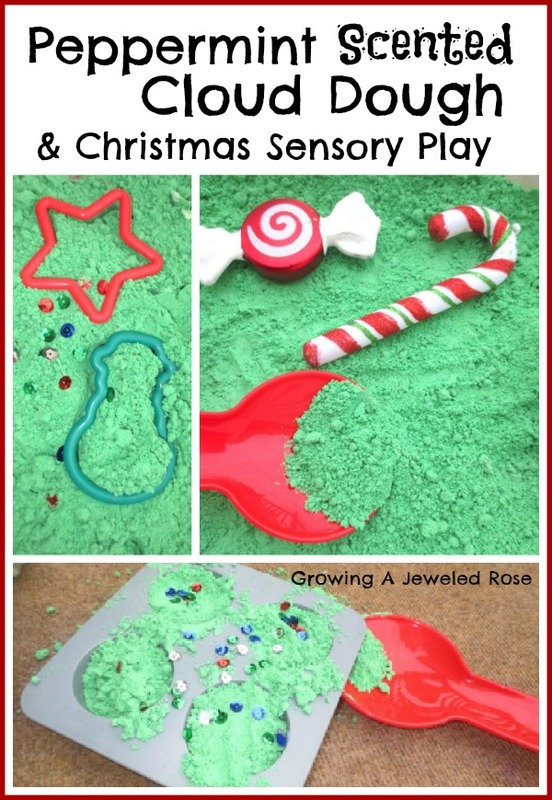 The whole sensory bin smelled amazing from just a few drops of peppermint extract! I also tossed in a few Christmas decorations and cooking gadgets and Rosie and Jewel went to work creating an array of sweet treats and pies. Sparkly Christmas sequins were just what the yummy treats needed and made the perfect finishing touch! Both girls had a blast with this simple Christmas activity! Rosie loved pretend cooking and Jewel loved throwing the cloud dough up in the air and all around. Once play time was over, we salvaged what we could and tucked it away for future play. Now our Christmas cloud dough is even better in that it is filled with the magical sparkle of Christmas! Storage: Cloud dough lasts indefinitely. Once play time is over you can store the dough in a covered bin for future play. Cloud dough is messy but vacuums up easily. 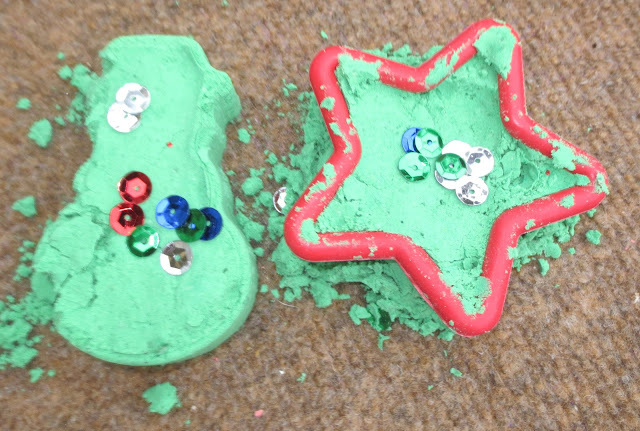 This really is such a fun Christmas Activity! Happy Holidays!